Just wanted to show what I've been up to since I didn't post my bi-weekly UFO report. Sorry the pic is so contrasty, but the sun kept coming and going. Anywho, the lovely knit you see above is the camisole tube from glampyre.com. It's been a fun knit, with some yo's, bobbles, and short rows thrown in there. The suggested yarn is Lana Grossa Basics Stop, which sounds like Lion Brand Micro Spun. I'm sure by now my lovely readers know my feelings towards this yarn, but if you don't then let's just say they are not very loving. The gauge for this pattern is 4 stitches to the inch on US 7's, so really a worsted yarn could work. 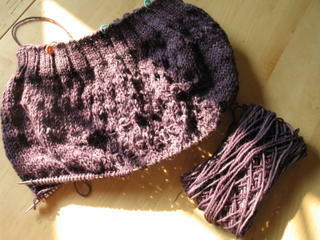 I'm using Araucania Nature Wool in, what I call, grape. Want to know some other yarns you could sub with? Sure I'll tell you some that come to mind, Classic Elite Bamboo (though this could get pricey), Blue Sky Cotton, SWTC Phoenix and probably Karaoke. I'm almost done with the stockinette section and then I have to start ribbing again, so I should have a FO pic in the next day or so...stay tuned! yum -- i love the grape cami. i think the bobbles are adorable, and it's a MUCH better yarn choice. waiting for the FO! i love the color as well! it must be exciting to be a test knitter. :) grats on that! that is a great looking pattern - can't wait for it to be released! the grape color is really nice too...perfect for that style of top. Have you seen my IK?